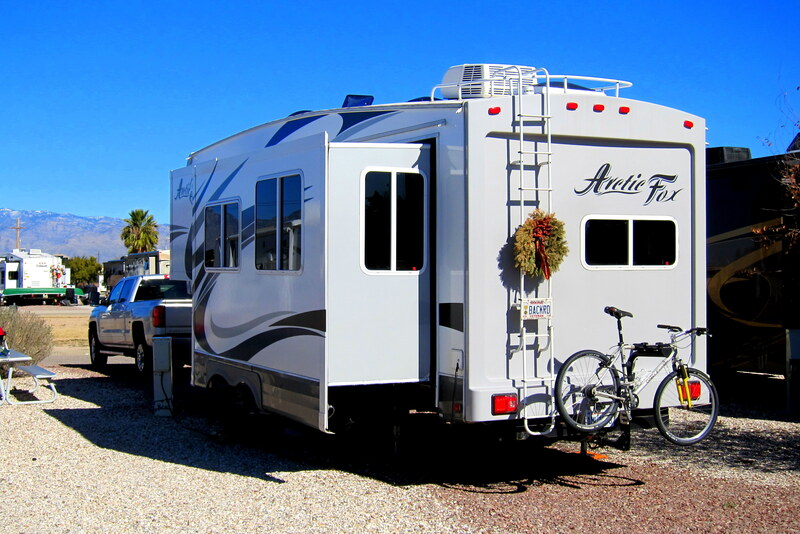 Wednesday, January 13 through Tuesday, January 19, 2016-Agave Gulch Campground, Tucson, Arizona: Yesterday, we relocated from Catalina State Park north of Tucson, to Agave Gulch located on the Davis Monthan Air Force Base, just south of the city. This move of a mere 23 miles made sense for a variety of reasons. First off, being a military base, the camping fees are substantially cheaper. 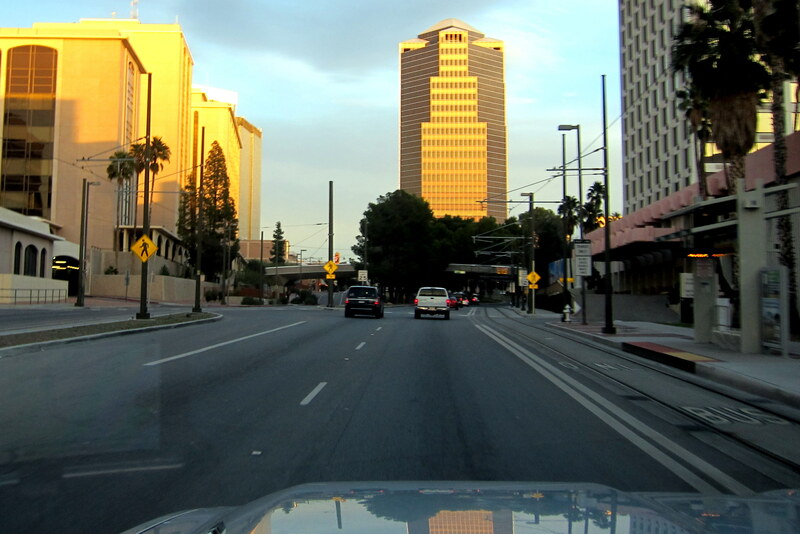 Secondly, I have a lot of business concerning my mother’s estate to transact in the City of Tucson, and this location is very convenient to downtown. And finally, with family in the area with whom we normally dooryard surf we seldom get to experience this fine camping facility which, by the way, is consistently rated in the top five on www. militarycampgrounds.us! So with bruzzin Dewey visiting his kinfolk in Culver City, and sister-in-law Bea spending time with her girlfriends on various adventures, it was a perfect opportunity to stay at Agave Gulch for a few days. 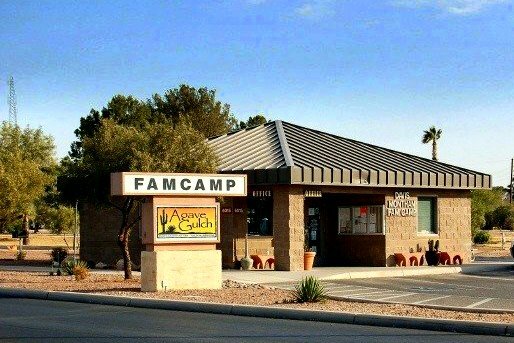 This military campground has one of the best rotation policies of any that we have stayed. They do not support “homesteading” and only allow a 21 day consecutive stay before rolling (no pun intended) off to overflow thereby allowing other camper’s an opportunity to move into a full hookup site. Of course, that policy also means that someone just checking in will likely have to camp in an overflow site…..which is what we had to do. 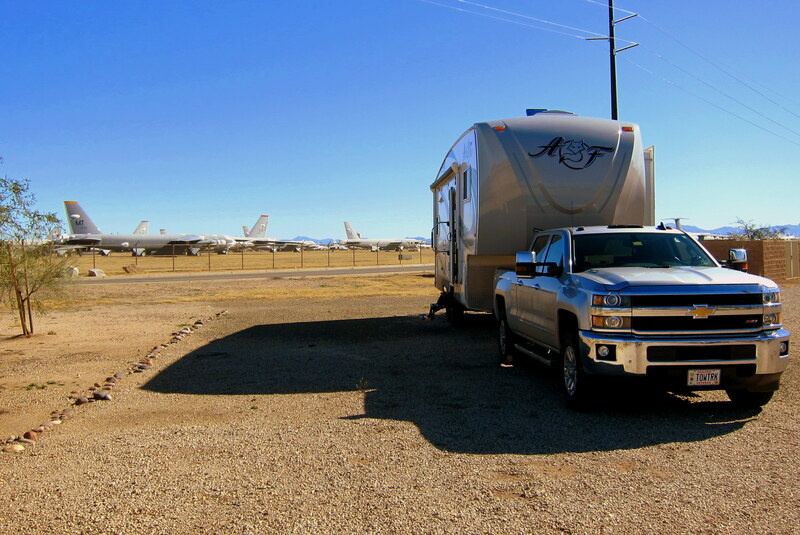 Overflow, which is dry camping only, is next door to the famed USAF ‘Boneyard”, so a lot of surplus aircraft were sitting nearby in the dry desert air awaiting their ultimate fate…..kinda like us old military retirees! A wait in overflow will usually be a few days until your turn for one of the 198 full hookup spaces arises. However, in our case we only had to wait one day before moving to the nicer site. As mentioned, I spent a few days downtown Tucson at the Superior Court House and the Registrar’s Office playing attorney. My mother’s estate was fairly small, consisting mainly of real estate, and Arizona state law allows one to act in their own behalf in small estate probate filings, thereby forgoing expensive legal representation. It’s a bit confusing and esoteric, but I muddled through. Ironically, I received some of the best guidance from the Arizona Bar Association!?!? 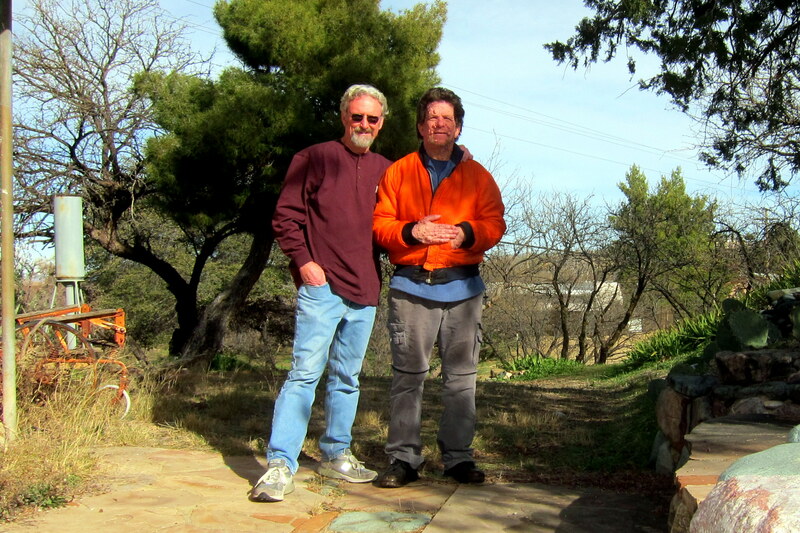 So with the legal hurdles overcome, brother Dan and I made a pilgrimage to our vast land holdings out in the small town of Oracle, Arizona. Wonder if there are any minerals or oil deposits under this land? There sure isn’t much on top of it…..well, unless one considers snow! 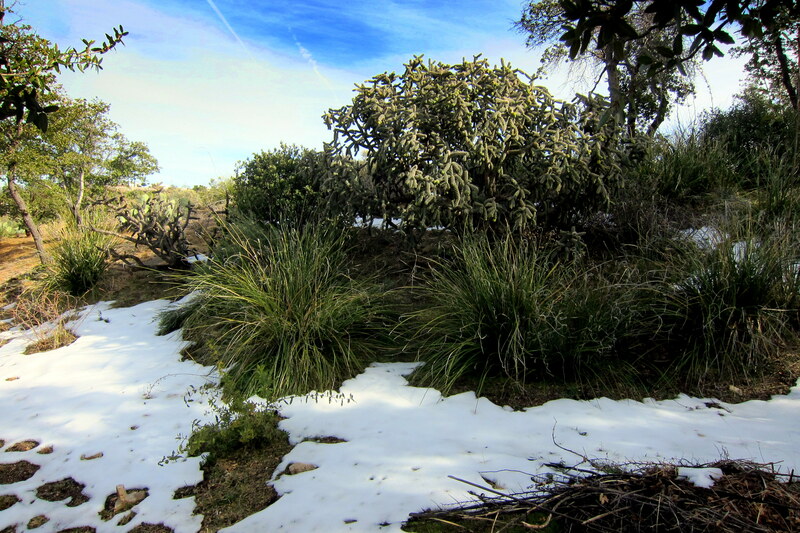 Yep, at an elevation of 4,500 feet, Oracle does indeed receive winter snow….it’s kinda weird to see snow surrounded by desert vegetation! We had a blast tooling about the back roads of Oracle and Dan enjoyed reminiscing about his formative days growing up in such an isolated and rural environment. 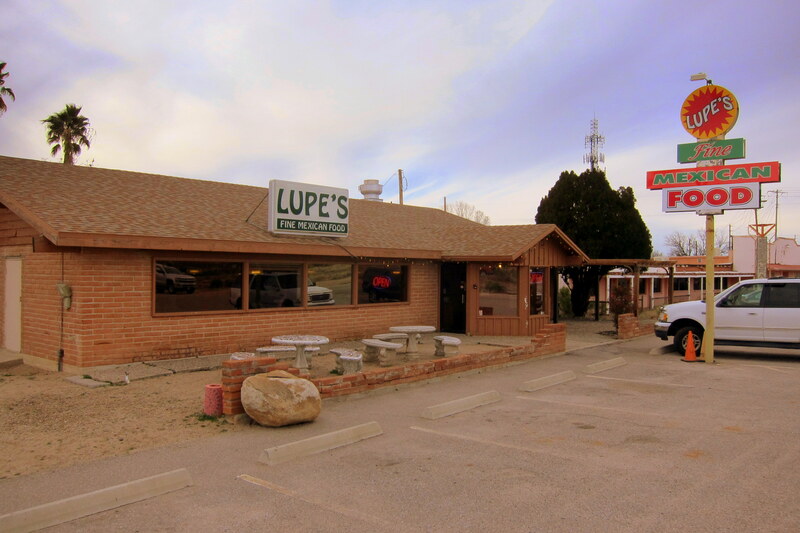 On the way back to civilization, we stopped for lunch at Lupe’s, the regional choice for fine Mexican cuisine! We enjoyed a great meal before heading back to civilization. After dropping Dan off at his house I returned to the camper for the evening. 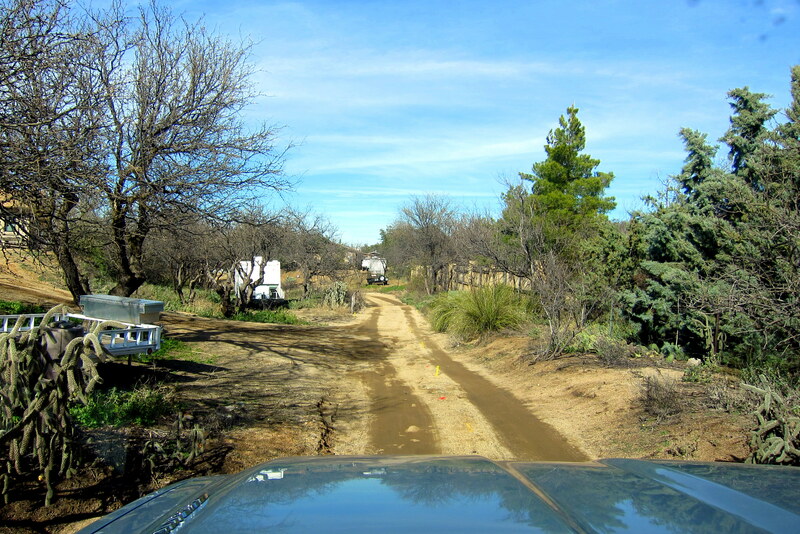 Our stay at Agave Gulch allowed Kit and I to explore what was to the south of the city. As usual, we were on a mission to find the more unusual or “off the beaten path” attractions. 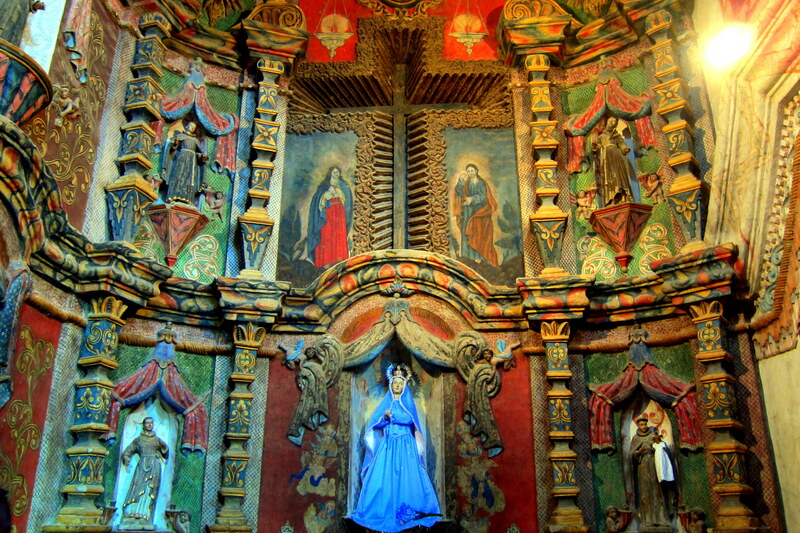 Our first discovery actually was a mission…..San Xavier del Bac, also known as “The Dove of the Desert”, is an active Catholic Church in the Franciscan Order. 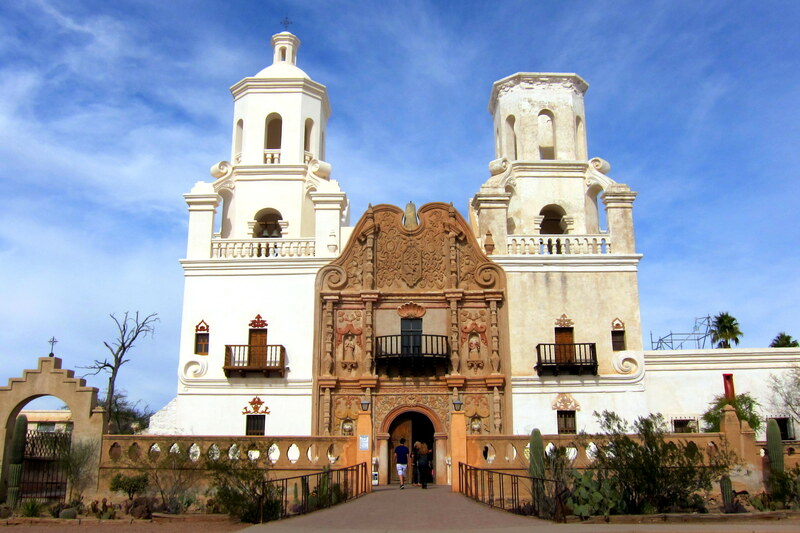 San Xavier del Bac was founded in 1680 by Father Eusibo Francisco Kino and is believed to be one of the finest examples of Spanish Colonial architecture in the United States. The left tower in the photo above is not damaged….it was never completed due to local hostilities, lack of funds and an absence of willing workers (read; Native Americans). After Spain claimed the right to land that is currently the Southern United States, the Catholic Church sent missionaries to colonize and convert the native heathens. Of the dozens of missions in what was called “New Spain”, there were six built in Arizona and another twenty-one in California. To protect these religious institutions from marauding natives, armed garrisons called “presidios” were constructed close by. Unfortunately the European settlers also brought contagious diseases that the native peoples were not immune to. This helped to decimate the very people the missionaries were sent to reform into Christians…..sad, but somewhat ironic as well. The region remained under the thumb of Spain until it was brought under U.S. rule following the Gadsden Purchase of 1854. In my research for this segment I learned a surprising historical fact…..originally the Gadsden Purchase was to include the entire landmass of the Baja California Peninsula! How different would a map of the United States look if that had happened?!?! 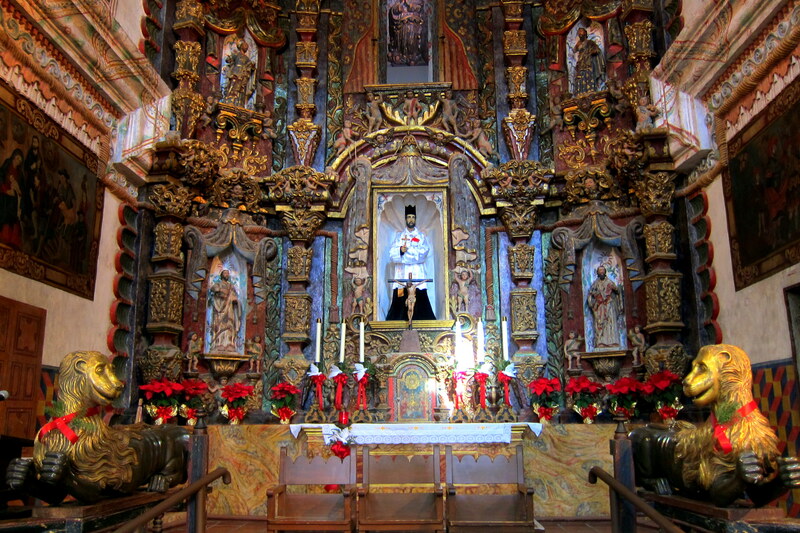 The Mission San Xavier del Bac honors 53 saints in its statuary, all exquisitely sculpted and painted. This collection of icons is reported to be the most in any one Catholic Church in the world. In addition, there is symbolic representation of 171 angels painted on the walls as well! The vibrant colors, textures and religious symbolism is overwhelming to the senses…..and, it covers every square inch of the sanctuary! Much of the statuary and interior design elements were actually produced in Mexico then brought north by donkey train for installation, painting or gilding. The beautiful religious motif is evident throughout the church ensconced in various niches or painted on the walls. You may notice the symmetry of the interior in the photo above, The Franciscan Order liked to keep things, well, orderly…..to the point where if a door was built on the left side of the mission, then a corresponding faux door was painted on the right to create the illusion of balance. 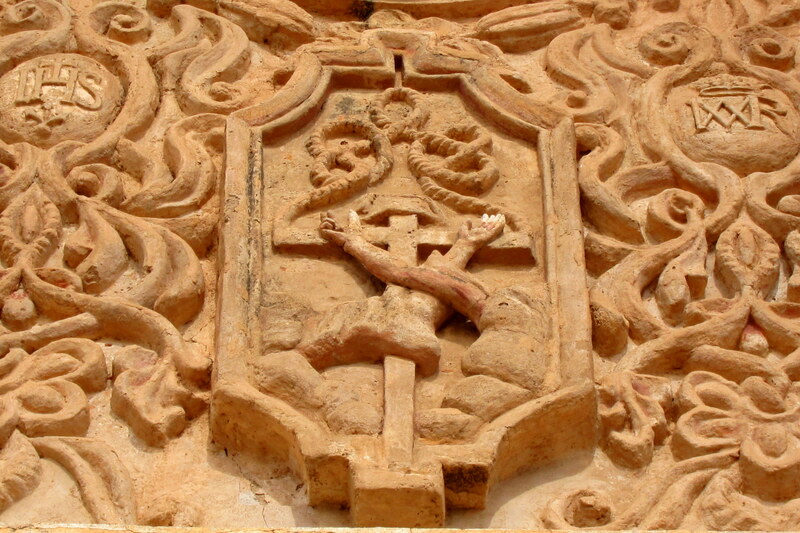 The Franciscan Coat of Arms is evident through the church. I thought it a bit humorous that the Coat of Arms consists of actual arms sticking out of coats! 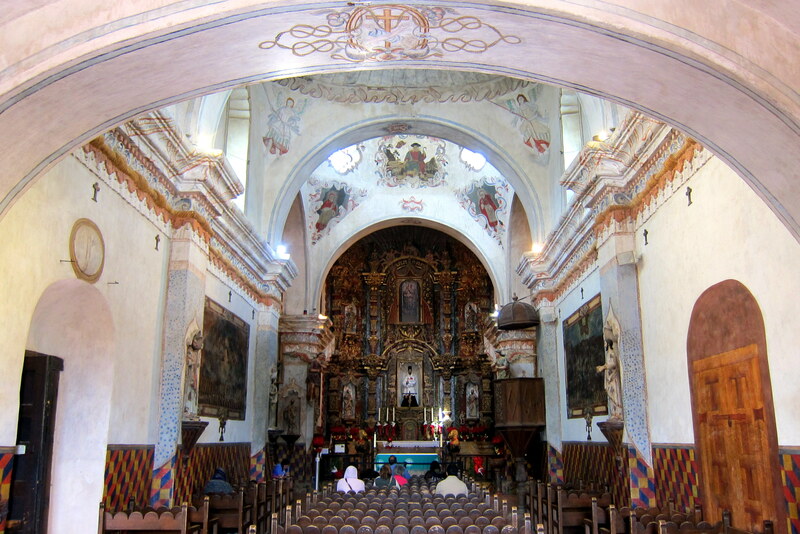 San Xavier del Bac is a viable church with a very active parish community. Mass is said daily and there are frequent weddings and baptisms celebrated in the church. The two gilded smiling lions that graces either side of the main alter are gold gilded and after peacefully residing inside the unlocked mission for over 300 years were abruptly stolen a few years back. The thief was apprehended but not before burning the idols. Distressed that such a heinous act of desecrating a centuries old mission, an art conservator named Gloria Giffords, researched and paid for their replacement dictating that the same materials and techniques be used to replicate the originals. If that name seems familiar it may be due to the fact that she is the mother of Gabrielle Gifford’s, former US Representative from Arizona, who was shot by a nutcase, is slowly recovering, and has been honored for her courage and resiliency by having a US Navy warship named after her. Yea…..you just knew I would slip a photo of a US Navy ship in here somewhere! After 43 years dinking around with these things, I just can’t help it!! 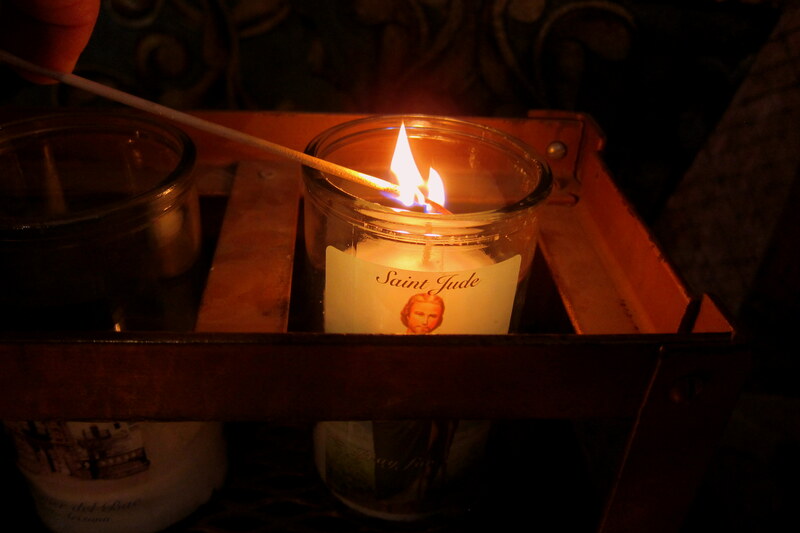 Before departing The Mission San Xavier del Bac, Kit and I purchased a votive candle to light in honor of all family members that have passed. 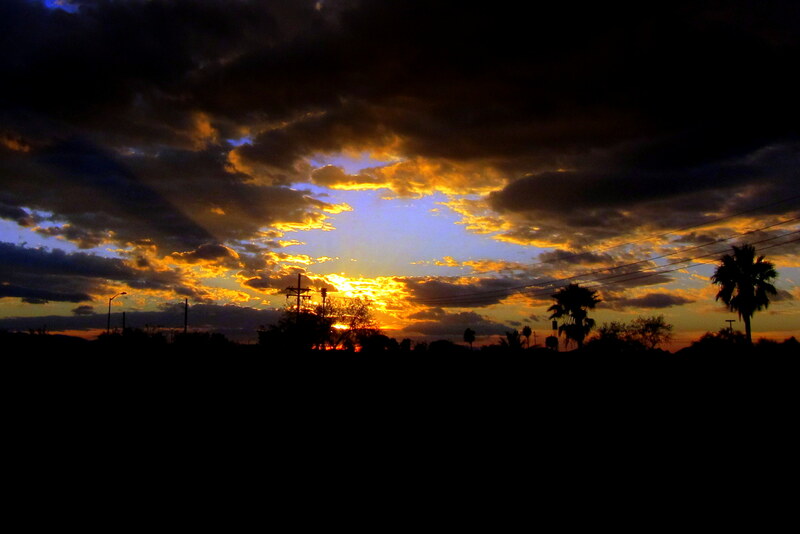 Following a great visit at a wonderful and inspirational mission, we continued south under a beautiful winter sky. As we passed the town of Tumacacori it was early afternoon and time for lunch. So I recommended the same place Dewey and I dined last week during our trip to Nogales, Mexico. Wisdom’s Café was busy with weekend folks out enjoying the great weather, but following a short wait we were seated. 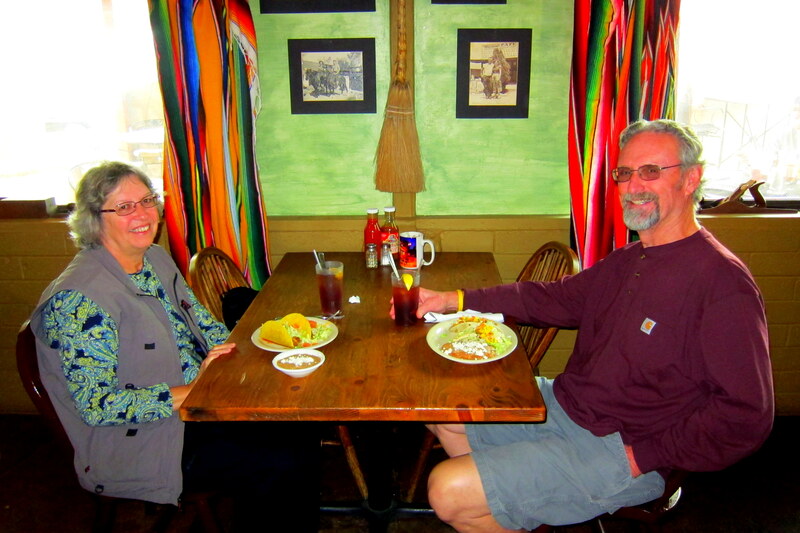 Kit agreed with me that the food at Wisdom’s was outstanding…..she enjoyed a taco plate and I went for the shrimp tacos and refried beans. After which we shared one of those incredible Fruit Burritos that Wisdom’s is famous for! 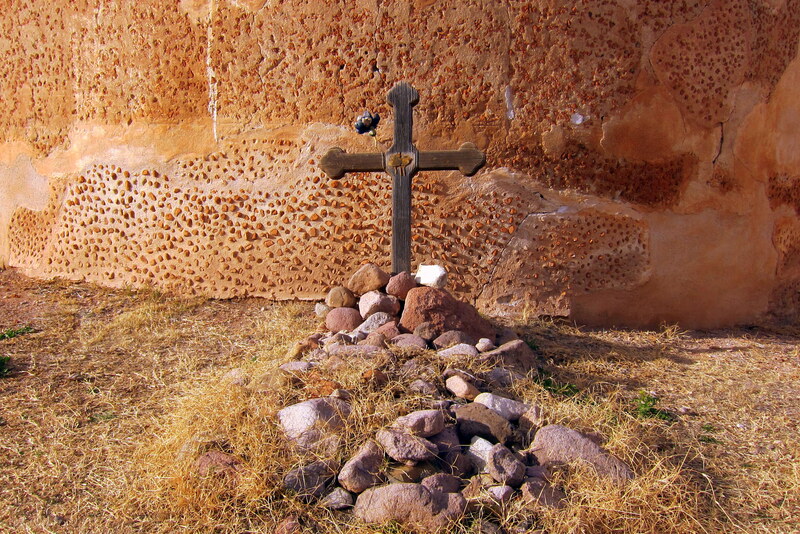 Following the excellent meal, a short drive brought us to Tumacacori National Historical Park. This 360 acre National Historical Park consists of three mission sites, of which only one is open to the general public, and none of which have been restored. 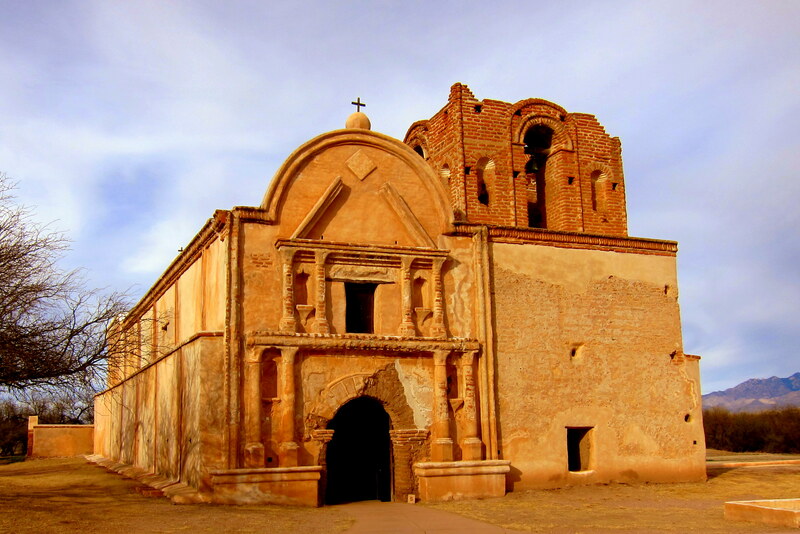 As its more famous neighbor to the north, this Spanish mission was founded by Father Kino as Mission San José de Tumacácori. Originally a small adobe structure served as the church until the mid-1700’s when an elaborate desert cathedral was planned. Construction was slow and sporadic, with active building only during times of prosperity or peace. As was the case of so many missions scattered across the southwest it was in use and attending to the religious needs of the newly converted population during construction, but was never fully completed. Constructed of adobe brick covered with plaster made from mud and Prickly Pear Cactus the mission has stood for many years…..ironically a stabilizing project undertaken by the park service a number of years ago caused more harm than good! Note the niches that originally contained statues depicting the Stations of the Cross. The wall shown surrounds the cemetery where many early parishioners lay entombed. 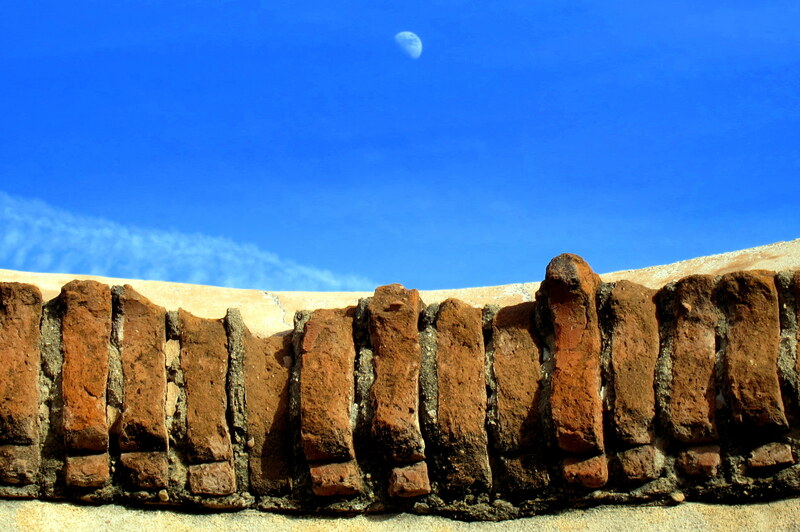 As the day wore on I noticed the moon rising above the missions walls and realized that the same moon was looking down on this mission as it was being built by the missionaries and their native parishioners over 300 years earlier. And that both may shine for many a moon to come (pun intended)! Kit and I thoroughly enjoyed exploring this area and have decided to seek out other Spanish Missions in the American Southwest. 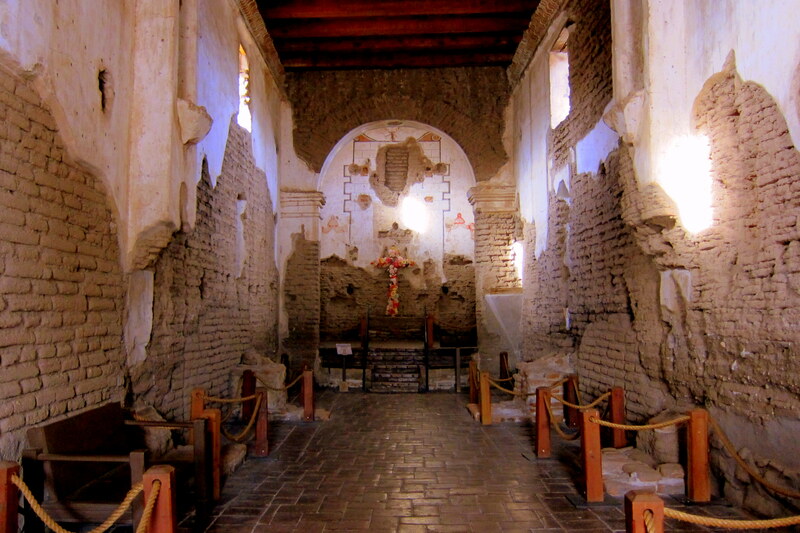 Many are featured along the famed Spanish Mission Trail that has now been added to our Bucket List! Returning to our campsite we enjoyed an evening cocktail as the sun set into the western sky. 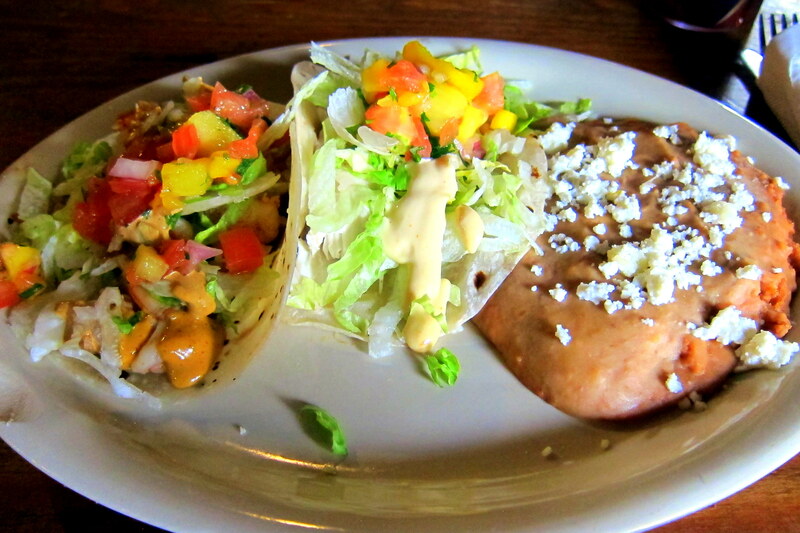 Our stay at Agave Gulch has come to an end and we must move on…..stay tuned. Kit’s Bit’s: I thoroughly enjoyed visiting both missions. As for the White Dove of the Desert, it is so incredibly beautiful. 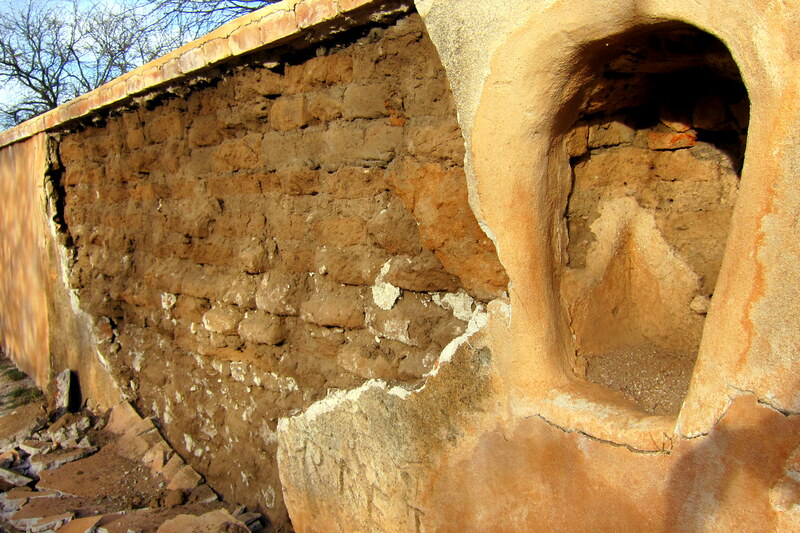 Tumacácori, though not fully restored, was so interesting; it was easier to understand how the natives lived during that time. It was a very hard life, indeed! While visiting these missions, my thoughts were with Miriam the entire time. She loved churches and attended many in the Tucson area over the years. Being a devout Catholic, her faith provided comfort during many hardships in her life. With Bill and Dan attending to some of the details of her estate during this time, it was a nice respite to visit both missions and remember her fondly during our time in both of them. She was so loving and a wonderful mother-in-law and Nana to our kids and grandkids. The phaonmneal pweor of the hmuan mnid, aoccdrnig to a rscheearch at Cmabrigde Uinervtisy, it dseno’t mtaetr in what oerdr the ltteres in a word are, the olny iproamtnt tihng is that the frsit and last ltteer be in the rghit pclae. The rset can be a taotl mses and you can still raed it whotuit a pboerlm. This is bcuseae the huamn mnid deos not raed ervey lteter by istlef, but the word as a wlohe. Azanmig huh? So, who’s going to join me and revolt against the tyranny of Mr. Funk and Mr. Wagnalls?!?! In the unlikely event that you haven’t visited the Sonora Desert Museum, Ms Polly and I strongly recommend it. As to spelling and usage of the language in general, I suggest that while its casual usage may be the subject of nitpicking pedantry, nevertheless, our language has evolved over several centuries into an incomparably complex and nuanced vehicle for conveying thoughts to others, and should not be lightly tampered with. (There, I ended a sentence with a preposition, but I don’t give a tinker’s dam.) Your own prose is an example of the best use of our language, and we can share your experiences because of your skilled use of words. Thanks. We thoroughly enjoy traveling with you wherever you go…and I am used to people not spelling words properly, my sister is worse than you are….besides, it just adds flavor to your narrative. 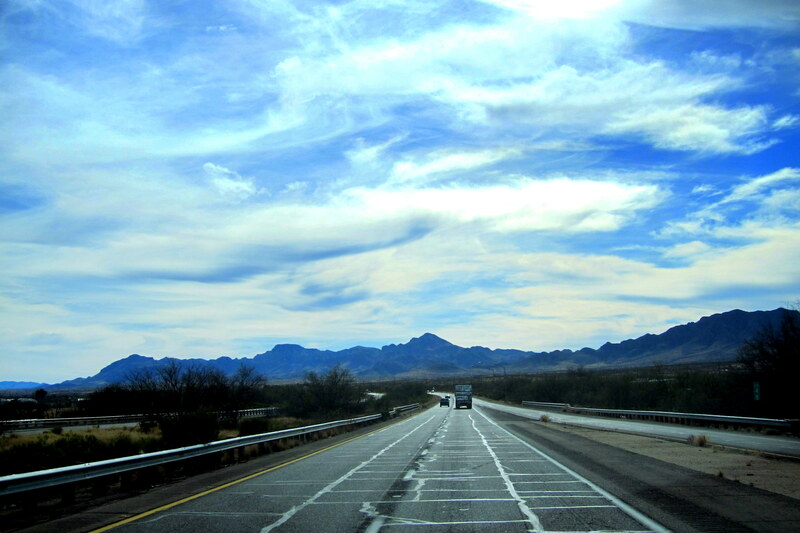 We thoroughly agree with Dan and Polly about the Sonora Desert Museum! Love that place! Also love learning about and enjoying second hand all the places you visit and research. Glad this period has helped you to enjoy memories of Miriam. I enjoyed meeting her and spending time with her. 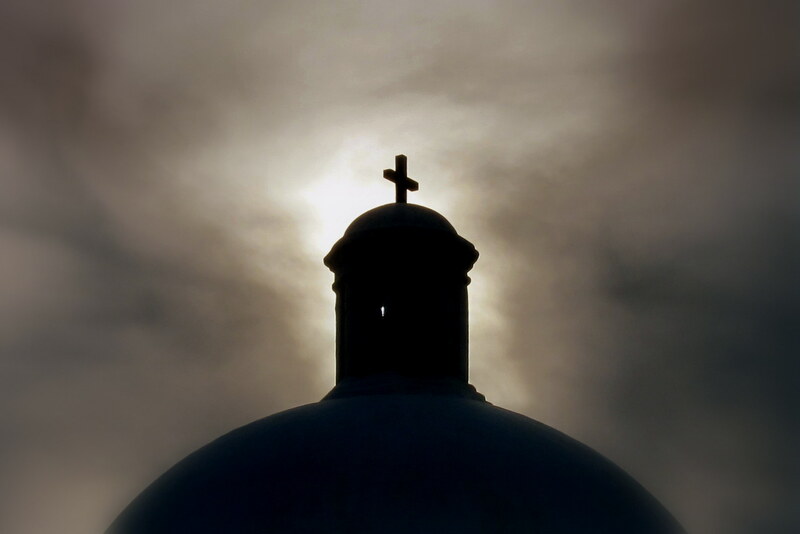 holdings”………I was excited to see yet another familiar place in the southwest… San Xavier del Bac. Visited there about 10 years ago. Tucson Studios is an interesting place too…some westerns were filmed there. 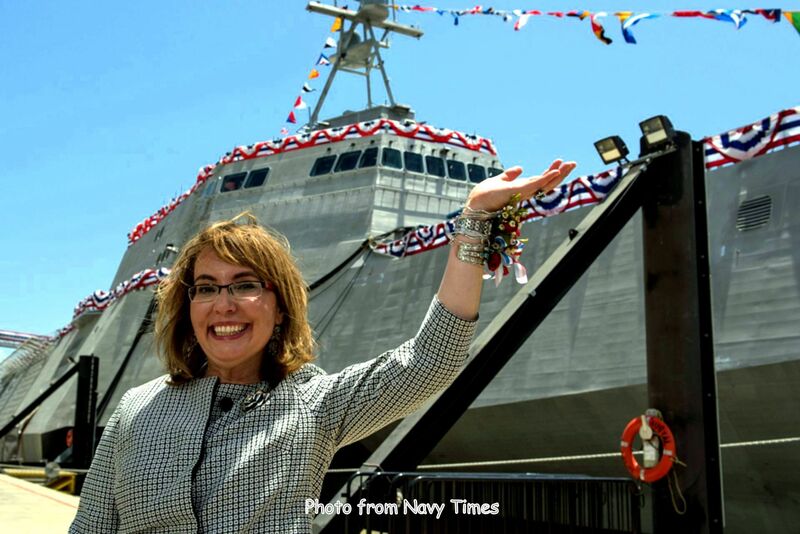 I love it that a naval warship was named after Gabby Giffords….how appropriate after the battle she has faced with such dignity. 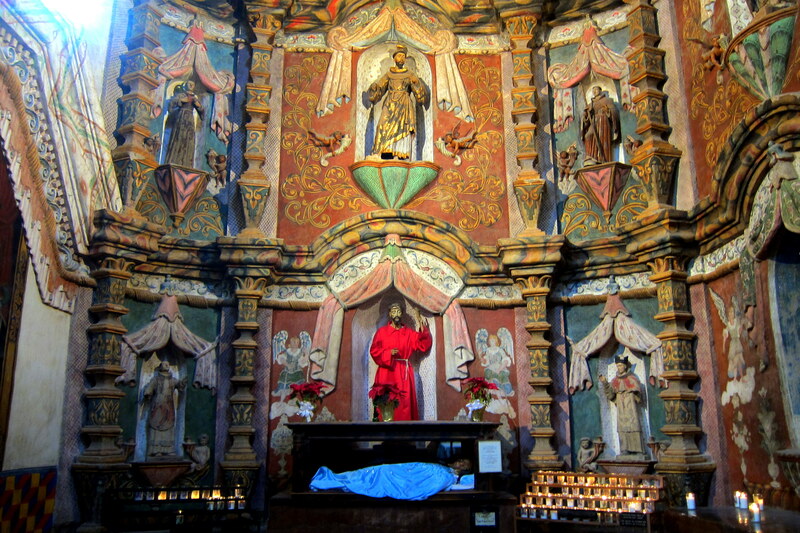 Bill, I thoroughly enjoyed your photography/commentary of the Mission San Xavier del Bac. Your photography was exquisite – can you IMAGINE getting MARRIED in that old, beautiful mission? Almost like getting married in Spain! As a California native, I know WHAT A TREAT you have before you if you enjoy visiting old Spanish missions, California having the majority of them! It’s truly a TREK up the CA coastline to see them all! Wishing you happy trails and awesome surprises along the way, Bill and Kit! Bill, I have been following your blog the last two years and I want say I really enjoyed it. Keep up the good work. Kathy and I have joined you on the road and as I type we are in Kings Bay, GA. Pulling chalks on Wed 17 Feb and headed to Pelican Roost in Mayport for 2 weeks. From there we are going for a few weeks to FT Myers to see a few Red Sox games. We will then head to Milton, FL in the middle of March to visit our daughter who is married to a sailor stationed at NAS Whiting Field. We will (as you say) “dooryard surf” in her yard until the snow melts in Maine and head home end of April.